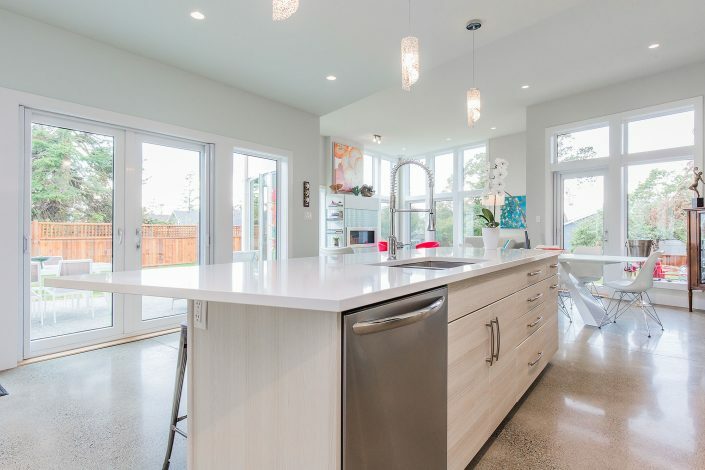 This beautiful new custom home is located on the Saanich Peninsula, an area north of downtown Victoria, British Columbia. Clients Luc and Paula wanted a contemporary new build with high energy efficiency. To accomplish this, we used a Daikin air to hot water heat pump which supplies domestic hot water as well as the hot water for the in-floor heat. LED bulbs were used for all interior lighting for the lowest energy consumption. 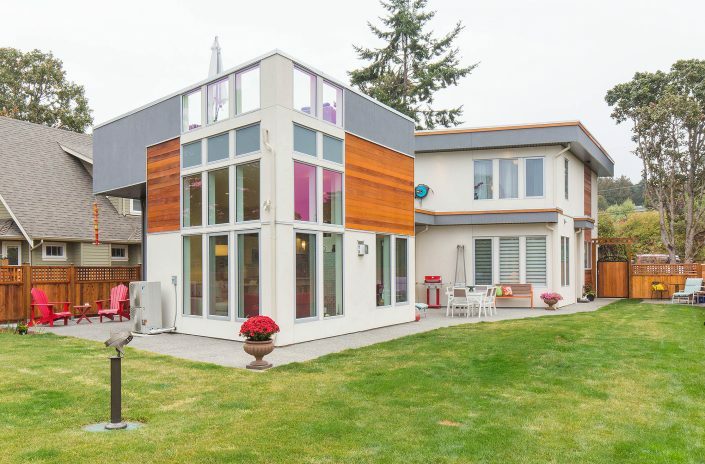 We went with standard batt insulation, together with windows and exterior doors provided by Euroline Windows (built in Delta, BC). Euroline uses Rehau hardware for general window hardware and all glass is Argon filled. Luc confirmed that after one year of occupancy, his energy costs averaged less than $100 per month! All interior doors are solid wood with opaque glass for privacy. 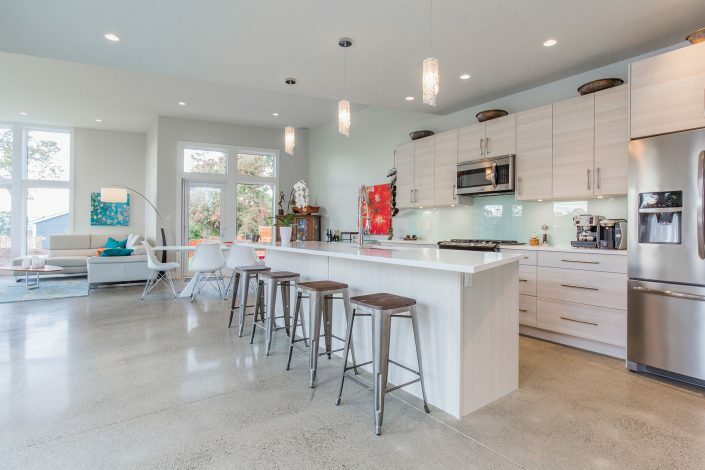 The main floor has polished concrete floors incorporating the in-floor heat. We used hot water radiators as the heat source for the upper floor area. The upper floor and stairs are finished in a high quality European Laminate and the gorgeous stairwell railings are made of solid maple with 6mm safety glass as the interior portion of the handrail. 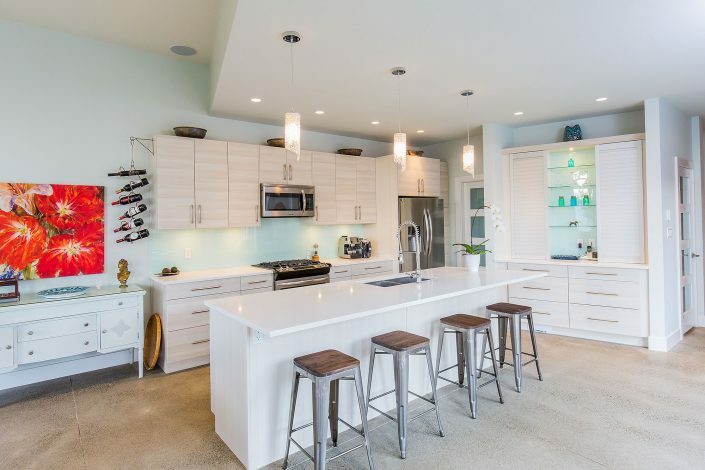 The cabinets, provided by Kitchencraft Cabinets, incorporate dovetail drawer boxes as well as full extension drawer hardware. We love Kitchencraft for their quality and outstanding value. 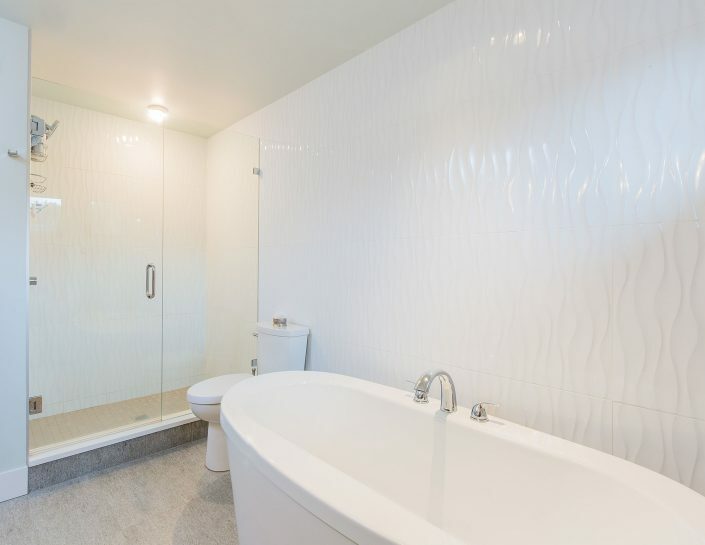 All of the countertops throughout the home are quartz and the shower doors are crafted with 10mm rimless glass. 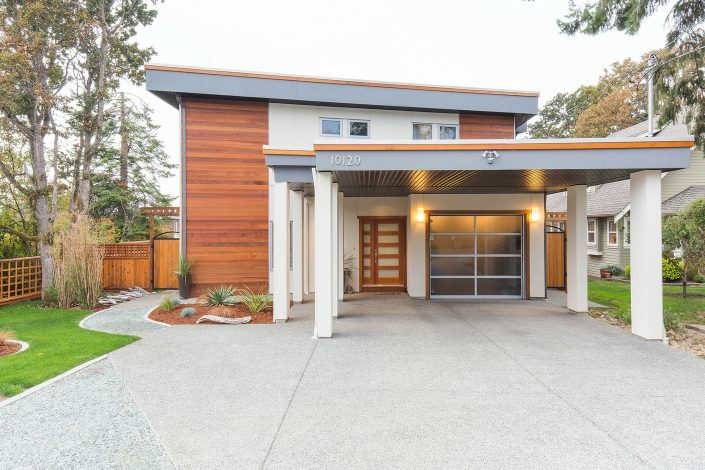 The exterior of the home is finished in acrylic stucco, and clear T and G cedar provide a contemporary west coast accent. The cedar was supplied and milled right here in BC (we always source locally when we can). A transparent finish was used to preserve and highlight the woods natural characteristics. 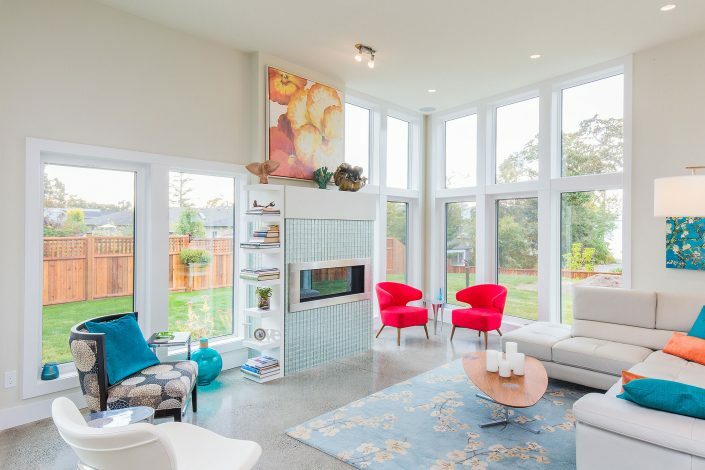 The result is a stunning west coast contemporary home that is incredibly energy efficient and built to last. Want to learn more? 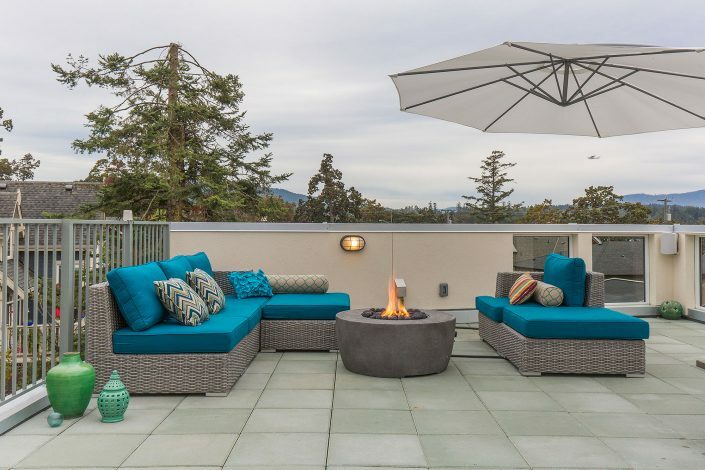 Contact Peter Schultze Construction today for a consultation on your custom home project in Victoria, BC.